So it’s been a very long time since I did a layout update and a LOT has happened. A year or two ago I reached a point where I really got stuck. When I designed the layout, a lot was left out and as a result I’m having to tackle issues that I hadn’t planned on. You may say that this is a normal aspect of building a layout, and I agree. However, being that I am new at building this type of layout, I really got stuck and discouraged. Between the Summer of 2016 and 2017 I barely set foot in the basement. I spent maybe 2 or 3 days of work over the entire time span. Why? I couldn’t figure out the track arrangement between Georgetown Junction and Chevy Chase. I had mistakenly ignored elevation and as such the design was asking for the track to go down hill about 6″ in about 10 feet. The grade was ridiculous and I tried many methods or alleviating it. None worked. During that time, I made friends with the son of a late member of my model RR club. He and I had met before, but never really spent time talking trains or what projects we were working on. 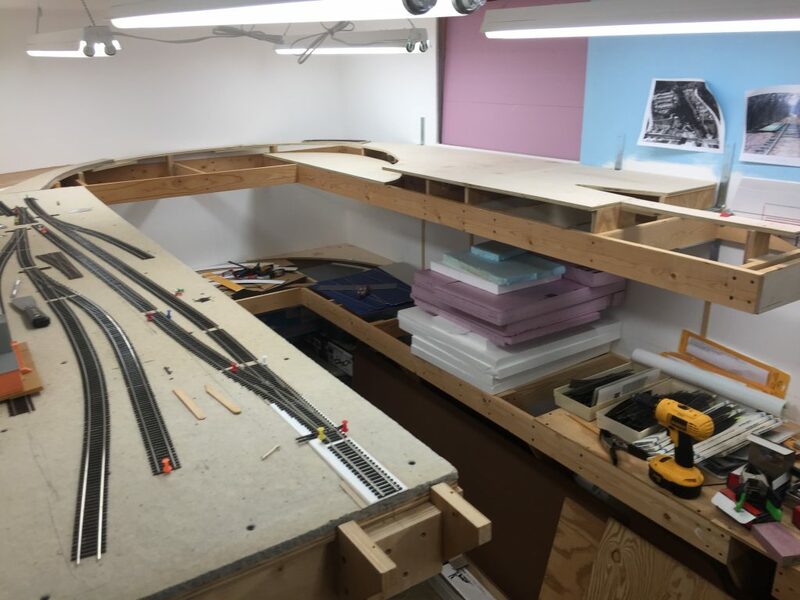 Turns out, he’s building a tremendous layout in his basement that is an absolute gem. (I hope to profile it some day!) He and I have been working on each other’s layouts over the last several months and I couldn’t be more happy on what progress is being made. More progress has been made in the last few months than in the last few YEARS! It’s really fantastic. He helped me figure out the grade issue, taught me about good wiring techniques, really seeking the soul of the prototype to dictate how the track plan is refined and implemented, good practices, the magic of plywood sub roadbed (I was planning on using splines) and how to make track mockups out of cardboard. All of this (and so much more) has put me on a fast track to getting a LOT done. I’m going to share some photos here, and plan on doing more in the near future. I am considering doing a vlog, but that remains to be seen, if I can find the time. More updates soon, I hope!